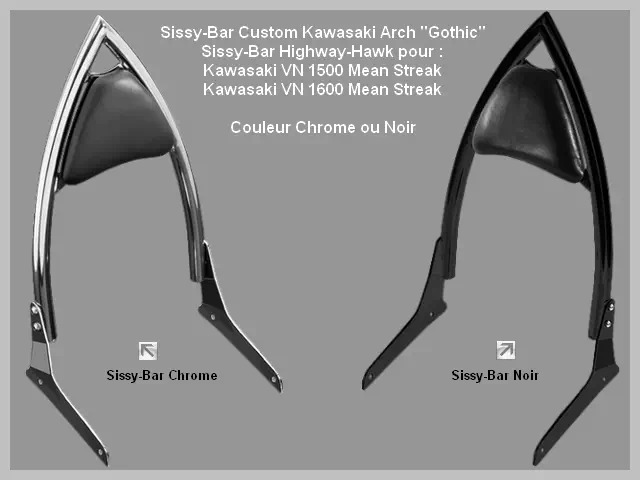 Sissy-Bar Moto Custom Kawasaki VN 1500 Mean Streak et Kawasaki VN 1600 Mean Streak Arch Highway-Hawk Chrome ou Noir avec Dossier Gothic Noir. 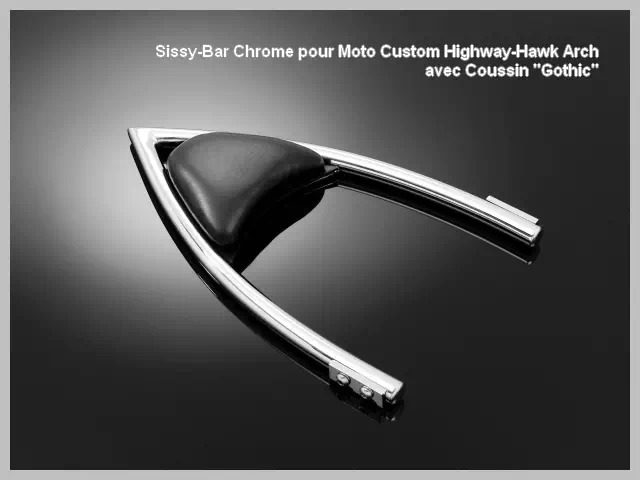 Sissybar Moto Custom Kawasaki - Sissybar Kawasaki Custom Highway-Hawk - Sissy-Bar Custom - Couleur : Chrome ou Noir. 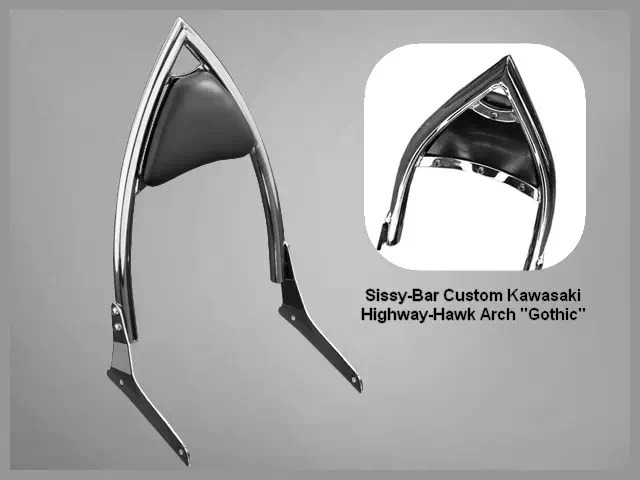 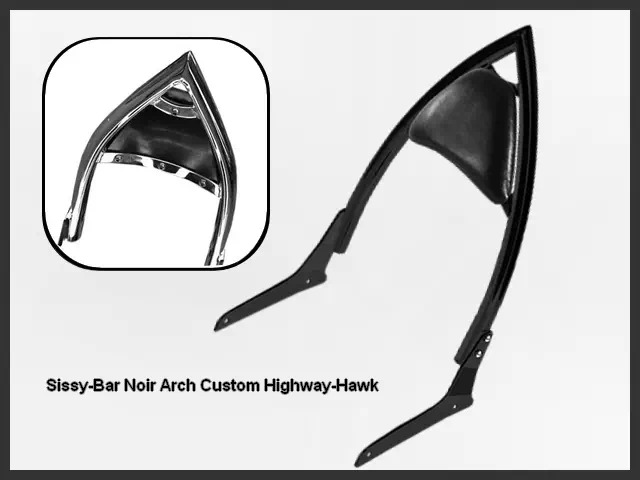 Sissy-Bar Arch pour Moto Custom Kawasaki VN 1500 et 1600 Mean Streak* : Kawasaki VN 1500 Mean Streak, Kawasaki VN 1600 Mean Streak. 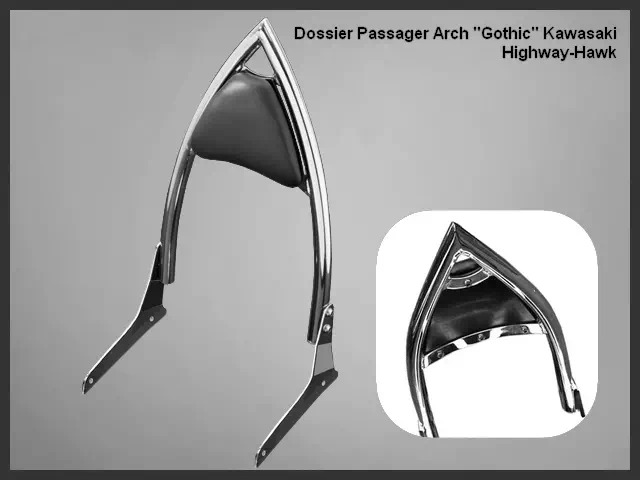 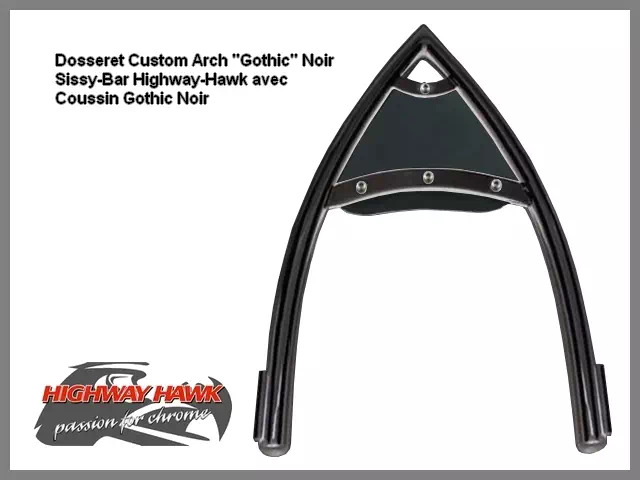 Description : Dosseret Arch Custom Kawasaki VN 1500 et 1600 Mean Streak en Tube Rond forme Arch Gothic Chrome ou Noir - Sissybar et Supports Latéraux en Acier Chromé ou Noir de Haute Qualité - Hauteur du Dossier Passager Gothic depuis le Garde-Boue : 400 mm, Porte-Bagage 267 mm Chrome ou Noir en Option. 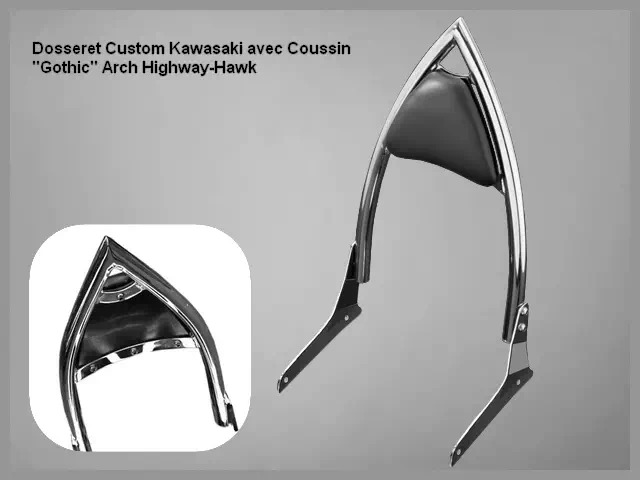 Dosseret pour Moto Japonaise Kawasaki Custom VN 1500 et 1600 Mean Streak, Autres modèles pour Custom Américain (Indian), Custom Japonais (Honda, Yamaha, Suzuki, Kawasaki), Custom Européen (Triumph) et Harley-Davidson : Esprit pure Custom. 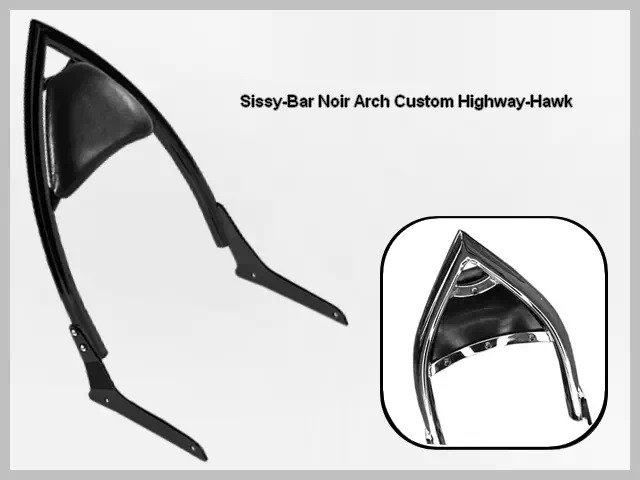 Sissybar Arch Moto Custom Kawasaki VN 1500 Mean Streak et Kawasaki VN 1600 Mean Streak Highway-Hawk avec Dossier Passager (Coussin) Arch Gothic. 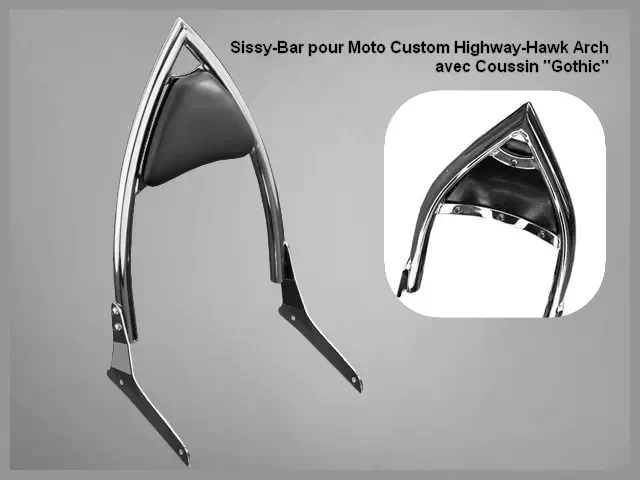 Sissybar Moto Custom Kawasaki VN - Sissybar Kawasaki Custom Highway-Hawk - Sissy-Bar Custom - Couleur Chrome ou Noir. 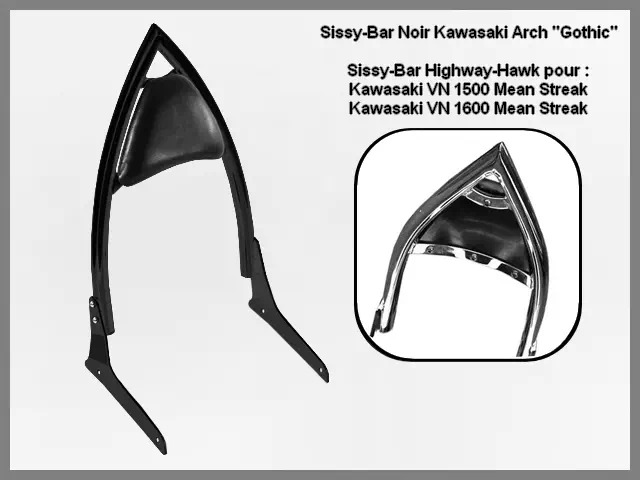 - Porte-Bagage de Sissy-Bar Arch Gothic Kawasaki VN 1500 et 1600 Mean Streak Couleur Chromé ou Noir en Option. 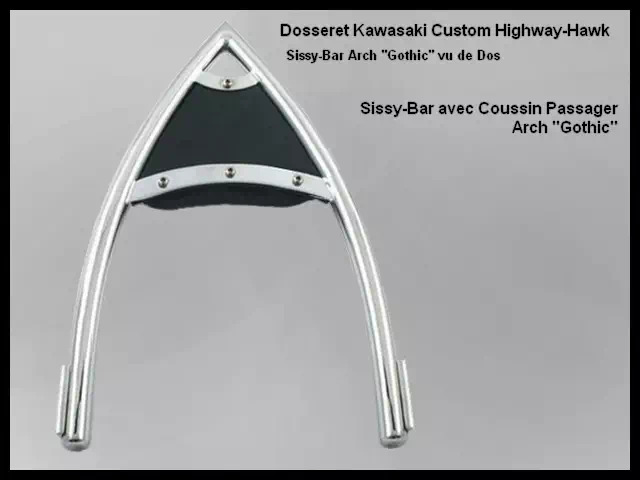 Dosseret Arch Gothic pour Custom Japonais Kawasaki VN 1500 et 1600 Mean Streak - Autres modèles disponibles pour : Harley-Davidson - Honda - Yamaha - Suzuki - Kawasaki - Triumph - Indian, Esprit pure Custom. 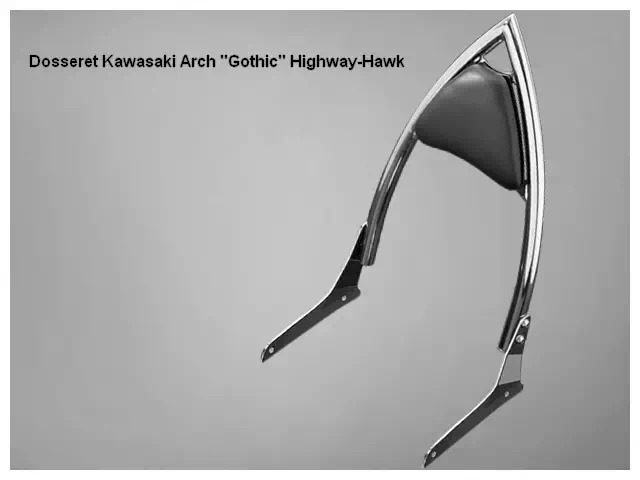 Offrez-vous le look "Gothic Biker Arch Rider" avec ce Dosseret Passager Arch Gothic pour Kawasaki VN 1500 et 1600 Mean Streak. 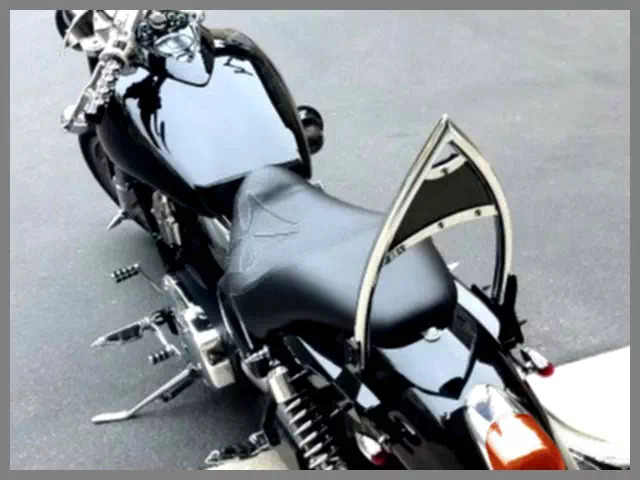 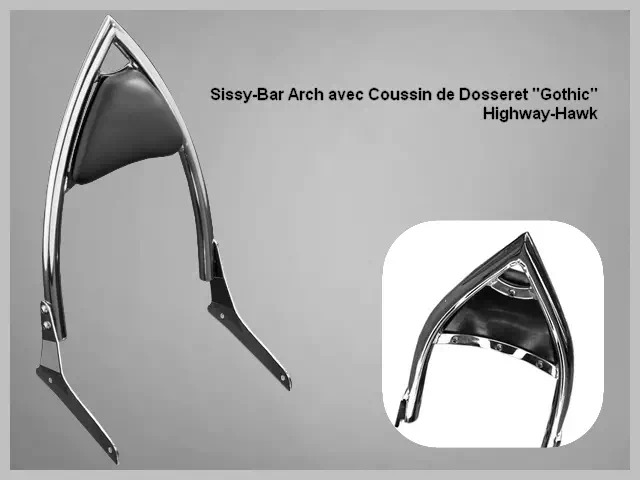 Vous pouvez choisir un Sissy-Bar Chrome ou Noir et un Porte-Bagage Chrome ou Noir en achetant un Sissy-Bar avec un Porte-Bagage. 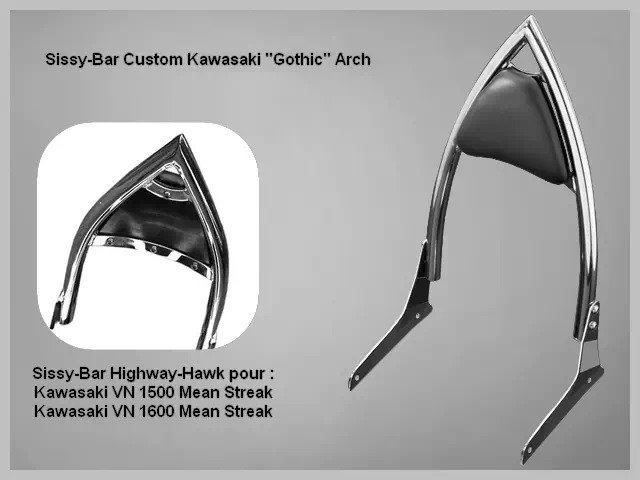 Highway-Hawk : une marque de référence pour votre Sissy-Bar Kawasaki VN 1500 et 1600 Mean Streak. 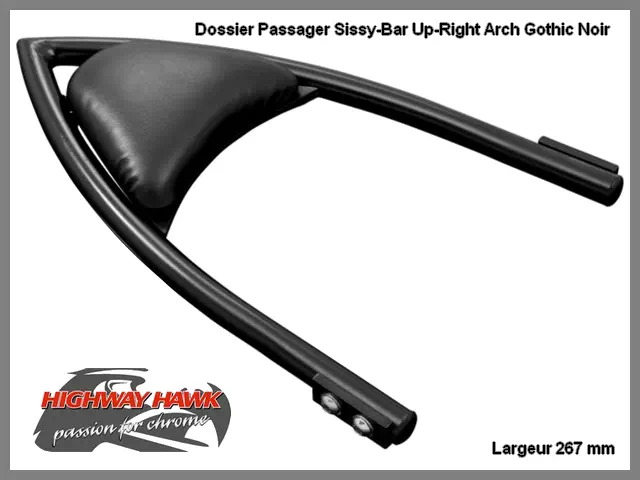 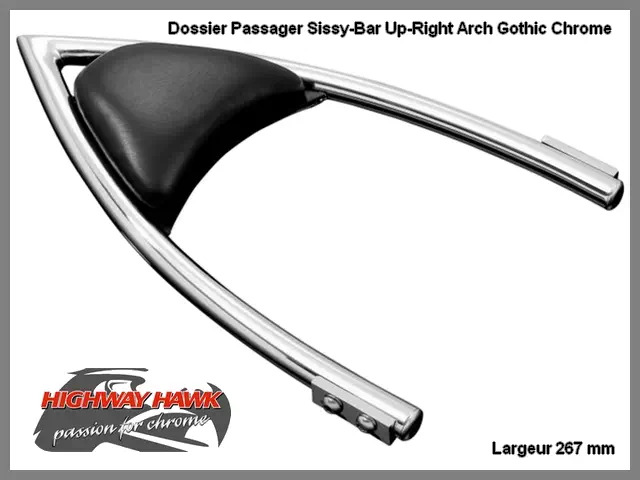 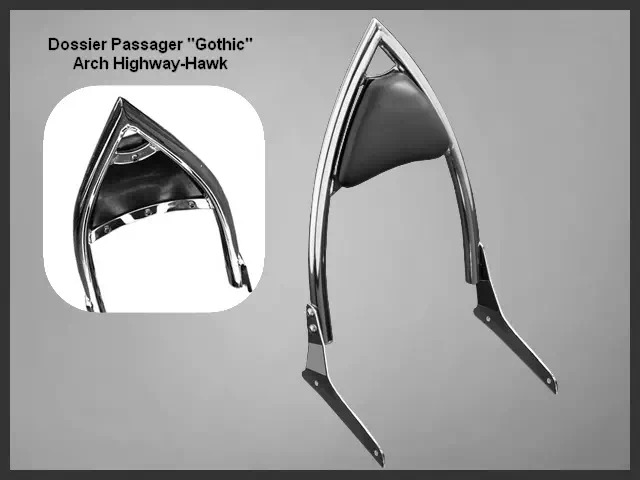 Sissy-Bar en Tubes Ronds Chrome ou Noir et Dossier Passager "Gothic" Noir du plus bel effet. 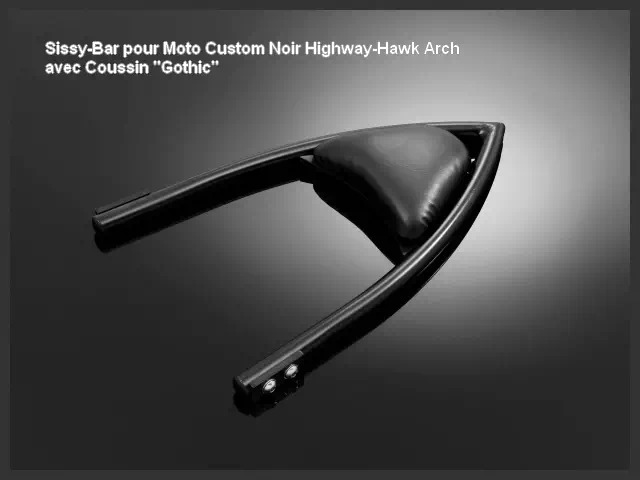 Moto Custom Kawasaki VN 1500 et 1600 Mean Streak, Accessoire Confort Pilote et Passager de Kawasaki Custom, Big-Bike, Cruiser, Basique, Bobber, Bagger, Chopper, Café-Racer, Etc. 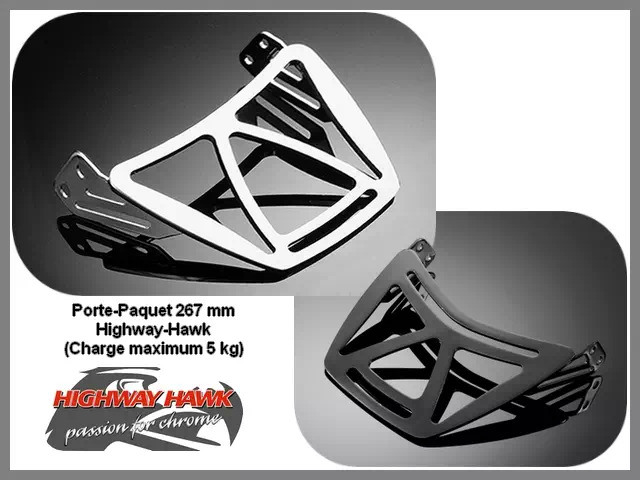 Motocyclette Kawasaki Custom VN 1500 et 1600 Mean Streak : Pensez à vérifier l'Emplacement de la Plaque Immatriculation (si Support de Plaque au dessus du Feu Arrière) pour la pose du Porte-Bagage "Tech Glide" 280 mm x 250 mm (environ), Autres Modèles pour : Custom Japonais - Custom Européen - Custom Américain et Harley-Davidson. 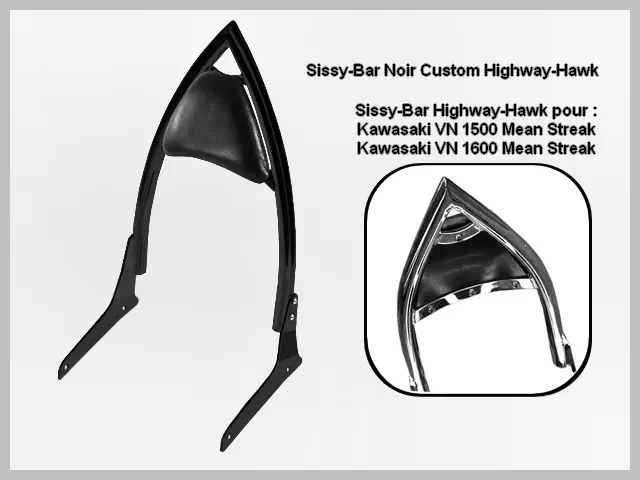 Kawasaki VN 1500 Mean Streak, Kawasaki VN 1600 Mean Streak.